The line snakes across an entire airport hangar. Hundreds of people, most of them teenage girls, stand single file and chatter excitedly, bouncing on their heels and occasionally dissolving into nervous tears. At the front of all this is the man they’ve been waiting to meet, a guy that almost nobody over the age of 24 has heard of: Connor Franta, YouTube star. “I love you!" Squeals Shelby, a 14-year-old Pennsylvania girl, as she reaches the front of the line. "I love you, too!” He responds. Shelby, like everyone else, is now granted two photographed poses with Franta -- and she, like everyone else, takes this decision seriously. Many fans spend their brief time with Franta discussing what they should do in their photo. Make the shape of a heart with their fingers? Mug cheek-to-cheek? Kick up a foot? Shelby goes with a high five. She leaves smitten. Franta will be here for hours longer. We’re in Anaheim, Calif., at VidCon, the world’s biggest gathering of social media stars, which draws 20,000 attendees a year. This is one of the many places Franta comes to meet his public, and he has good reason to keep them engaged: His audience has made him rich. He has a net worth in the millions (he won’t confirm or deny reported estimates of $3 million), and what he calls a “significant” source of his income comes from promoting products through his various social media channels: On YouTube, where 5.6 million subscribers watch videos of him talking about his life or enacting short skits, he sells ads, product placement for the likes of Coca-Cola and NatureBox and offers a 30-day free Audible.com subscription. He also promotes brands on Twitter (where he has 5.14 million followers), Facebook (two million), Instagram (5.1 million) and Snapchat (with views in the millions). He has even taken this philosophy into products directly tied to him, like his 2015 memoir, A Work in Progress. “I was very clear with my publisher from the beginning. 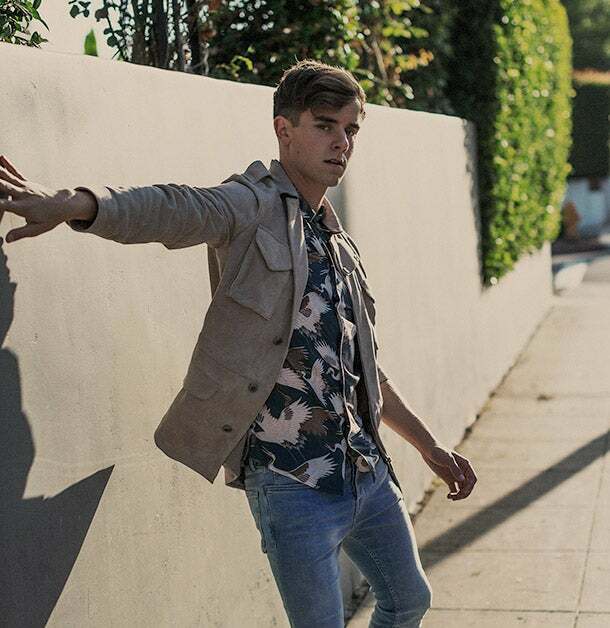 I said, ‘I hope you realize my face will not be on that book,’” Franta recalls. This isn’t how the deal usually goes. Grace Helbig, Hannah Hart, Michelle Phan -- these are A-list names in social media, and their smiling faces all front their tomes. But Franta had to “fight to the death” for the hardback cover he designed, which looks like Jonathan Adler-inspired wallpaper. He won the battle and then the war: A Work in Progress spent 16 weeks on the New York Times best-seller list and sold 500,000 copies. But of course, the book still had his name on it. Building a business -- a real, tangible thing that grows on its own -- is a challenge he is only beginning to undertake. And his quest will make for an interesting case study of the social media era: How well can millions of followers translate into millions of dollars? Time will move on. One day, Franta will walk into a roomful of teenagers just like the one in that airplane hangar at VidCon and not a single one will recognize him. It’s inevitable. But if he does his job right, those kids will have all bought his products. And that, to Franta, equals success. It's a good life for a 23-year-old, but Franta is nervous: he knows this can't last. Franta grew up in tiny La Crescent, Minn. (population: 4,830), along with three siblings. He recalls an idyllic childhood, playing sports and spending summers in a cabin on a lake. He loved to swim and dreamed of being an Olympian. His father was a doctor at the Mayo Clinic; his mother, a homemaker. The family was close. “There were no secrets between us,” Franta says, although that wasn’t entirely true: Franta is gay, and with no role models to guide him in his small Midwestern town, he kept his orientation a secret. At age 13, around the time he started to develop crushes on boys, he also discovered a new site called YouTube. It was mostly just a kind of clearinghouse for random video clips of dancing babies and sneezing pandas, but Franta stumbled across people who were also making content -- self-described “YouTubers” like comedian Shane Dawson and tech reviewer iJustine. The summer before his senior year of high school in 2010, Franta filmed himself giving a meta-meditation on his desire to make YouTube videos, then uploaded it to the site. “I got about a hundred views that first week, most of which were me, refreshing my browser,” he says with a laugh. If that summer in Los Angeles had an effect on Franta’s professional trajectory, it had an even bigger impact on him personally. Franta, then 21, was surrounded by proud members of the LGBTQ community. Though his subscriber numbers kept climbing -- six months later, he was up to three million -- he was “living a lie,” he says. “I was making content that didn’t make any sense, like ‘My Top 10 Qualities in a Girlfriend,’ when in my head I was thinking about all the qualities I was looking for in a boyfriend,” he says. The disconnect weighed on him, but the fear of coming out was compounded in an unusually modern way: Would his sexuality cause him to lose his viewers, and therefore his new life? Franta watched dozens of coming-out videos on YouTube, read blog posts and joined forums. By January 2014, he felt ready to share his secret. He told a few friends, then his family, and by December of that year, it was time to come out to the world. His viewers didn’t disappear after all. Instead, they kept coming. Even the teenage girls, whose crushes on him never abated. And so he started to wonder: If he can build an audience, what else can he build? "People really want to see the real you and the real intentions behind everything." The album sold well. A few months later, a second compilation was also successful. Franta learned something: He didn’t need to soft-sell anything. His fans were excited to buy. In July 2015, Franta formalized the project: He gathered two cofounders -- Andrew Graham, his agent, and Jeremy Wineberg, owner of the music distribution and licensing company Opus Label -- and created a record label called Heard Well. It produces compilations of up-and-coming musicians, licenses the music from artists and their labels and then sells it all in physical and digital form. “Listen to these guys,” Franta would tell his fans, “they’re going to be the next big thing,” and an unknown musician would gain millions of new listeners. The idea was so successful that Franta invited other social influencers to create compilations (and earn a cut of the sales), and today, Heard Well has about a dozen clients, among them YouTube superstars Jc Caylen, the Syndicate and Tyler Oakley. Every album they’ve released has charted in the Billboard Top 200, selling thousands of copies. “We have an audience of people who want to know what we’re interested in, so it makes total sense that we’re using our marketing in a way that monetizes the product for all involved in a beneficial way,” Franta says. “Once I have a compilation together, I tweet it, Instagram it, Facebook it and YouTube -- video it -- and that reaches more than 20 million people. It’s an amazing promotion for everyone involved.” Someday, Franta says, Heard Well might also take the traditional route and sign artists, tour or create a music festival with its acts. For his next trial, Franta approached the San Francisco company Ritual Roasters, which operates coffee shops and sells wholesale. He’s a coffee addict -- his fans know this -- so he figured a coffee brand from him would feel authentic. He sampled Ritual Roasters’ beans, picked one he loved, then designed packaging and held a 48-hour presale to test demand. He sold thousands of pounds of coffee. So he formalized this business as well. The product became Common Culture Coffee, under an umbrella brand called Common Culture. He sells the beans as a subscription service, delivering different flavors to subscribers every two months. The product side is handled by Ritual Roasters, which means Franta doesn’t have to hire any full-time staff to manage it. But this isn’t a name-licensing deal. Franta himself manages the creative side -- new packaging, which flavors to send and, of course, the brand’s growing social media presence. (The company has more than 70,000 Twitter followers and 160,000 on Instagram, and is “growing every day,” he says.) He is exploring advertising, as a way to reach beyond people who are simply buying Connor Franta’s coffee -- and lure in people who are interested in Common Culture Coffee. Franta plans to continue on like this, building out his portfolio. To wit: In 2015, he collaborated with the popular vintage-style brand Junk Food Clothing on a line of T-shirts and hats in a palette of pastel colors. This year he launched a full clothing line on his Common Culture website. He says he does everything -- the design, promotion and photographs of models against a makeshift backdrop in his living room. "I want to continue pushing myself creatively and see where it takes me. So I'm going to just continue doing that." “The screams come through the phone,” Graham says. He won’t discuss exact numbers on these nascent businesses, but since beginning his foray into brand building, he has learned a few things: His fans are eager buyers, but there’s a lot more work to do. He knows it’ll take more time -- and more experimentation -- to reach people beyond his own sphere of influence. Still, there’s an encouraging way to look at this: If he were selling only to his fans, his customer base would have a hard ceiling. But given his ambitions, he doesn’t just have 5.6 million YouTube subscribers -- he has 5.6 million brand evangelists, whose reach is exponential. By that math, it won’t take much to reach someone who says “Connor who?” and yet still wants to buy. That’s a start.